These are the craziest striped socks I've made yet. I like red and purple together (thank you, Wesley Dennis, for the gorgeous picture in Marguerite Henry's book _King of the Wind_, [and thanks to carbonel for the heads-up about my stupid mistake on the title!] where the horse Sham is wearing red & purple...the first time, outside flowers, that I saw those colors together. I was eight.) 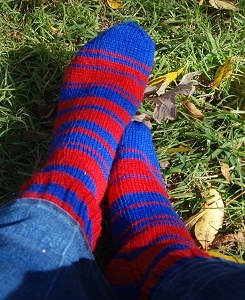 And since I had made red socks and purple socks, I used the leftover yarn from those socks as the base for these. But then things got complicated. I tried the Bitterroot Rainbow first, as I was also knitting a conventional swatch of Ruby River. Instantly fell in love with the look of it against both the red and the purple, so much in love with it that I'm thinking of reserving it as a stripe yarn to be used with a variety of colors instead of turning it into a pair of regular socks. (If I could walk into my LYS and buy another two skeins to make a whole pair out of, I would, but I have to special-order it via the yarn store.) You can see it just below the gusset, against purple on one side and red on the other--it's plenty bright enough to stand out. Next, after a plain red section, I tried one of the Mountain Colors reds. Although in the skein and cake, it looks very different from the plain red, in a small stripe this doesn't show much against the Ella rae yarn. I think it would make good stripes against another color, and when sandwiched between the blue and the purple on the sock to the left, it does show better, is less mistaken for a smudge or a shadow. There's also the thing about hand-painted yarns, that sometime the color you most want on top of the sock tends to hang out underneath or on the low sides, where no one can see it, with only the occasional appearance above. 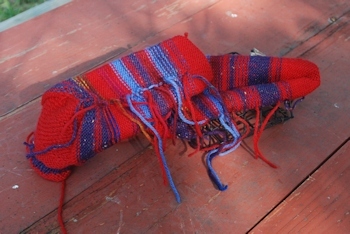 Some people claim to like weaving in ends. They're welcome to weave in mine! I finally finished weaving the ends in last night, and strengthening the weak places in the "joins", so the Desert Canyon or Canyon Sunset socks are not in their final "weekly bag" of socks, ready to wear. Probably today. For this pair of shorties, I used the "eye of partridge" reinforcing stitch not only on the heel flap but under the heel itself. 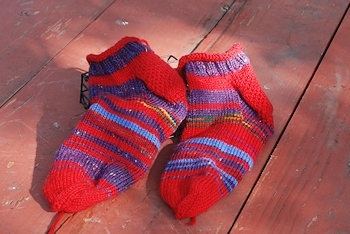 My basic design for these socks makes the very top, the short stretch below the ribbing and the heel flap, and the toe all in one color (red, here, obviously) while the ribbing can be any other color (here, color #2, the purple, but in some socks a singleton color). 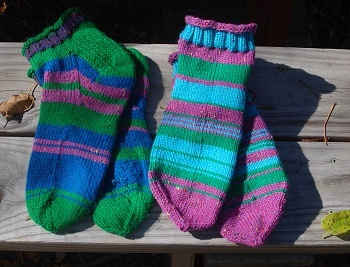 Color #2 is the gusset area (most or all) and the single-row stripe on the toe; in between may be two alternating colors or several, as here. In the only "regular" sock pair I've striped so far, I've used the same basic idea--the leg and heel flap one color (the same as the top stripe of the ribbing, in that case) and the gusset (or most of it) in the second color, with the toe in color #1, with a single-row stripe of color #2. I don't much care for weaving in ends, though it's sometimes a soothingly domestic chore, on those occasions when I want to do something knitting related but don't actually want to knit. The latest socks are gorgeous. The weaving in thing taxes my eyesight--maybe after the cataract surgery it will be easier. Knitting itself, I can half-way feel my way through, but I can't with weaving-in. Glad you like the wild socks. My feet are happy in them at the moment, though I wonder if my kludgy fixes for the "joint" gaps will hold up. The tropical lagoon ones won't be that bad, since it was on the front part of the second canyon sock that I finally figured out a foolproof (for this fool!) way to change colors frequently without loose places or pulling the tails so tight the sock was yanked out of shape. When I go places and see yarn, I now wonder if it would suit you or not. Here is something that looks like you might enjoy it. I can verify that the alpacas at the farm seem very happy and healthy. Oooh...I like that in several of the colors. Not sure that alpaca makes good-wearing socks, though. But as a sweater....but no, I'm not ready for sweaters yet. ObCopyeditor: It's _King of the Wind_; the other one is by Margaret Mitchell. I can't count how many times I've read that book. I read everything else I could find by Marguerite Henry, too, but this one really spoke to me. Also, the video clip here is primarily intended for Fair Isle knitting, but it also includes a bit that describes how to change colors and deal with the ends as you go. It helps if you know how to knit both American and Continental, at least while you're doing the switchover, but I found it worthwhile to teach myself the one I didn't know just for this. DUH. Thank you! I can't believe I made that mistake since I never read _Gone with the Wind_, and read _King of the Wind_ over and over and over. Major brain-break. I will correct it in the original post, with credit for the catch. And the video clip was fascinating, though (again eyesight) I found it hard to see. After the surgery I'll try that again. In the meantime, my kludge method of just knitting a stitch with both yarns and then going on with one every few rows is working on the lagoon socks. I just love these vibrant clashes of colour, the asymmetry in the striping, and the way you've designed these (in particular, how you've knitted a tiny stripe nearest to the toe, as a theme). Very appealing -- my feet would be very happy in these socks! I noticed in comments you're going for cataract surgery. When do you expect this wool go down (if you don't mind sharing that info), as I'd like to keep you in my thoughts around that time for prayers and good vibes and all that. My eyesight has taken a drastic dive lately (I'm 35), so as someone who loves to craft, often embroidering in tiny, precise stitches, I find myself cringing in empathy. Wow. An appropriate mis-correction courtesy of my phone haha. Yes, I have a designated driver. Sorry your eyes are going downhill fast--mine have always been bad and started needing bifocals years ago--and the cataract has gotten much worse in the past year. I hope yours stabilizes soon and is correctable. ok. Thanks, I'm afraid as long as I'm working in my current job, they will continue to decline. Too much computer use -- otherwise, the job is enjoyable and pays well.